The Simpson Desert is a vast area of sand dunes located mostly in central Australia, which overlaps into the borders of Queensland and South Australia. In fact, it is the biggest parallel sand dune in the world shaping into long red waves from the wind. This uninhabited region is surrounded by Finke River on the west, MacDonnell Ranges and Plenty River in the north, the Mulligan and Diamantina rivers on the east and Lake Eyre on the south. To get to The Simpson Desert, first book your flight to Australia. This seemingly endless deep red sand covering 143,000 square kilometers and its weather is one of the driest places on earth. Made of 1,100 parallel sand dunes, the view of the vast red sand is truly unbeatable. However, contrary to the most assumption, The Simpson Desert is vibrant with animals, plants, and varies of birds, and even underground water that turns the desert into an oasis. As one of the driest places on Earth, The Simpson Desert’s annual rainfall is recorded at only 150mm-200mm. The weather varies wildly – during the day it may reach up to 50 Celsius, while during the night it may drop to subzero Celsius. The central desert is uninhibited while the fringes are dotted with many attractions and can be accessed from Alice Springs and have cattle-rising settlements. The Simpson Desert is home for rare Australian desert animals. Therefore, some of its regions have been protected along the borders of Queensland, Northern Territory, and South Australia. There are four national parks to protect the biodiversity, which are Simpson Desert National Park, Simpson Desert Conservation Reserve, Simpson Desert Regional Reserve, and Witjira National Park. 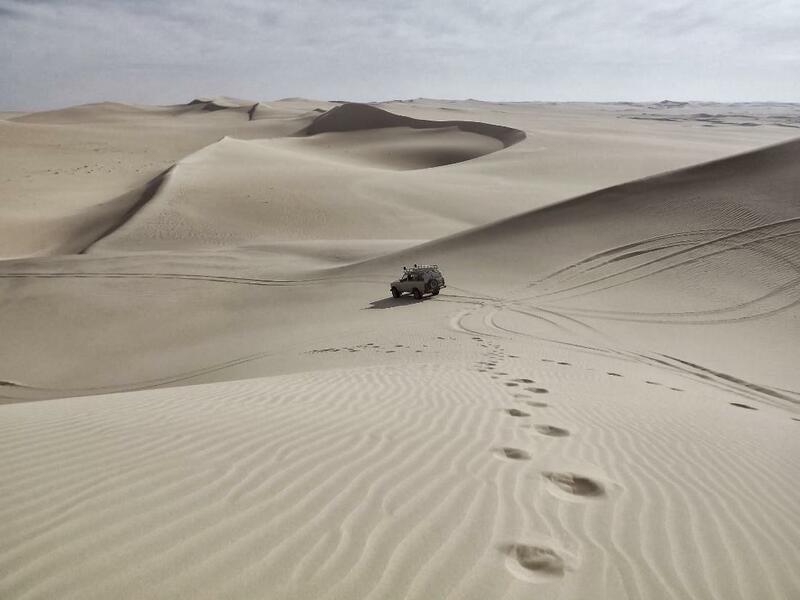 In order to cross the desert, 4 Wheel drives are mostly used to overcome the thick dunes. Despite the harsh climate and condition on The Simpson Desert, some creatures have evolved to adapt to the situation. The animals on the Simpson Desert are varied, ranging from mice, snakes, even birds, including the rare fat-tailed marsupial mouse in a conservative area. One of these animals is Mulgra. It is a tiny nocturnal mouse with many adaptations. Mulgra stays out of the heat by going out during the night to protect their self from the heat and from predators. Still looking like a mouse is The Spinifex Hopping Mouse. It eats grasses, wildflowers, and bugs when necessary and is also nocturnal. Another adapting animal in The Simpson Desert is the brown snake, which eats small rodents and small rats. Grey Falcon is like the tertiary consumer in the Simpson Desert. They eat small rodents and snake that lives in the desert. The plants in the Simpson Desert is dominated by Sandhill cane grass and spinifex. These species are highly resistant to drought and growing all over the place. Fun fact about Canegrass is that this plant provides shelter and food for many desert animals and has a long root system that holds many sand dunes together. Spinifex is almost similar to cane grass. It functions as a stabilizer for the sand dunes and can be found throughout the coastline of Australia and New Zealand. Touring the Simpson Desert is ultimately a once in a lifetime experience. Crossing the sea of endless sand dunes require thoughtful preparations and reconnect fully with nature around. Being in the middle of the desert with nowhere to be seen, you need to see the beauty of the journey. The tours are available in 7, 9 or 13 days that combines certain tracks to fulfill your adventurous soul. Being one of the largest deserts in the world there, consider touring it when the time is ideal to visit. May, June, and July are the ideal months to visit the Simpson Desert. While visiting in June or July, you will be greeted with vast blue skies and the temperature is around 20 Celsius during the day, while during the night the temperatures may reach 0 Celsius. Therefore, prepare your warm clothes and winter gear. July is also the perfect month to visit this breathtaking desert. On July, you will get the best view of Milky Way and you can sleep underneath the countless stars shining from the sky. Spending the night in the desert can also be comfortable while touring the Simpson Desert. Some tours provide specifically engineered bathroom pods, hot showers, and flushing toilet. Enjoyable camping tents and equipment are also provided to give you a good night rest. Wait no more and book your best adventure with us!